Abdelfattah Abusrour is from Bethlehem-Palestine. He co-wrote SALUT C’EST NOUS and NOURRIR DE FAIM in France. He wrote and directed WAITING FOR THE RAIN, TENT, THE ORPHAN, WE ARE THE CHILDREN OF THE CAMP, BLAME THE WOLF, HANDALA. His short play FAR AWAY FROM A VILLAGE CLOSE BY won first prize in the Deir Yassin Remembered Festival-London in 2006. He performed in and directed many plays. In 2014, he directed THE DIARY OF ANNE FRANK for Burning Coal Theatre in NC, USA, and Samah Sabawi’s play TALES OF A CITY BY THE SEA for Alrowwad Theatre. 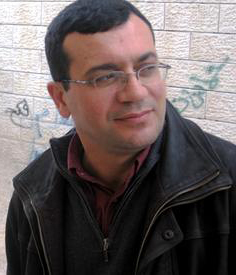 Abusrour has a PhD in Biological and Medical Engineering, is a recipient of the first Ashoka Fellowship in Palestine, and Synergos Social Innovator Award. He is Founder and Director of Alrowwad Cultural and Theatre Society and elected President of Palestinian Theatre League from 2009–2013.